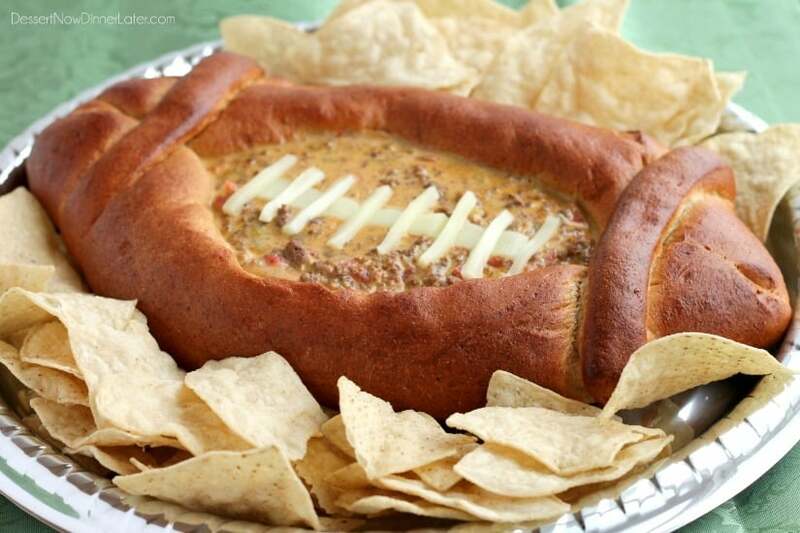 Football Dip Bowl - Dessert Now, Dinner Later! I don’t always make football food, but when I do, you can betcha it’s going to be awesome!!! 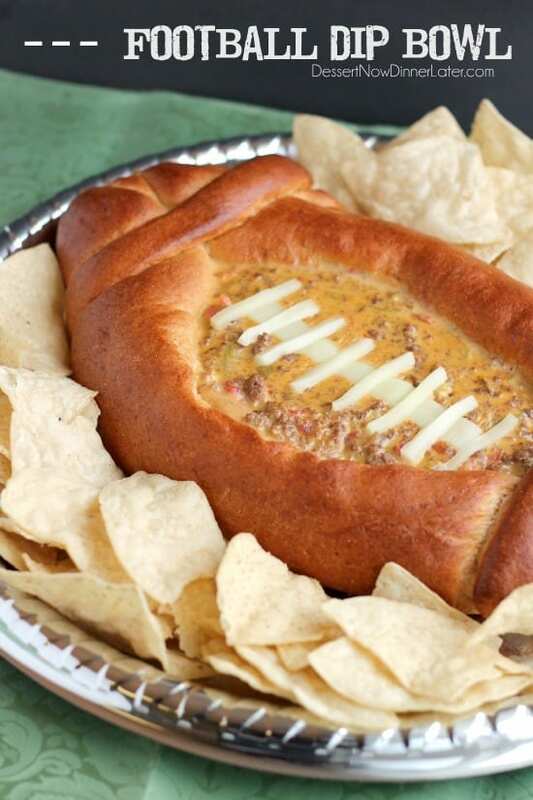 This Football Dip Bowl is made with a frozen whole wheat dough that is shaped into a football with a place to hold your favorite queso dip! 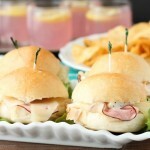 Make laces with cut up string cheese and you have a fun, football themed party food! I know the Super Bowl is coming up, and if you read my blog regularly, you know I don’t watch football, haha. 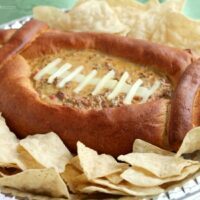 BUT I’m a huge fan of any parties involving food, so I’m here to help you have a stunning football dip bowl display! 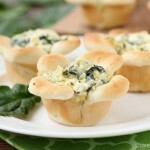 This recipe is broken down for you in step-by-step photos on the Rhodes blog today! I just love playing with their frozen dough and this football is just too cute, in a masculine, football party kind of way. 😉 So head on over ASAP to learn how to make this for your next football or Super Bowl party! FOR THE QUESO DIP: Cut cheese into cubes and melt in microwave. Add remaining ingredients and stir until well combined. Heat again and serve, with chips, in Football Dip Bowl. 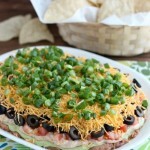 When I saw a photo of this dip on FB the other day, pretty much all I could think was DANG! I wanna be that creative! This is seriously SO cool, Amber! 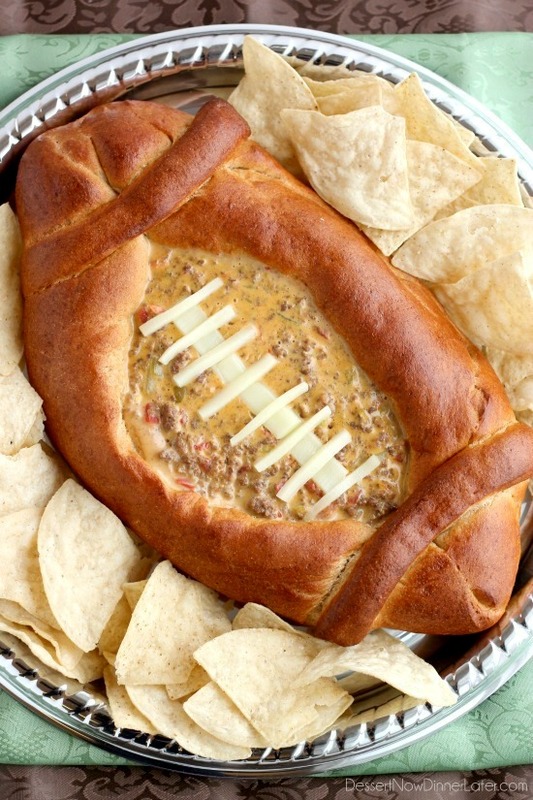 My football-lovin’ brothers would be all over this dip bowl! You all are giving me way too much credit! Rhodes gave me the recipe, all I did was re-create it for them. 🙂 It is fun though! This is amazing, Amber! Forget the chips. I want to tear the bread off and dip it into that queso dip!! My stomach literally just growled for this. I know right?! Why use chips when the bread is right there? You are so stinking creative!!!! Well, Rhodes provided me with the idea this time, but it did turn out quite cute! Thanks Rhonda! Now this is by far the best Superbowl recipe I’ve seen! The football bowl looks perfect and the string cheese for the laces is too cute. This would go over so well at our party, I may have to give this a try! Oh, you’re sweet! Luckily Rhodes supplied me with the idea, because I am not typically that creative on my own. This is awesome! I’m not a huge fan of football either, but I’m in love with all the food that goes with it. Food brings people together, that’s for sure! Okay, this is so cute! I’m not in it for the game either, but if the food is this good, I’m there! I’m so glad to hear there are so many other ladies not into football besides the food. 😉 Thanks Ashley! This is so awesome, Amber!!! What a creative and delicious idea!!! Thank you Brenda! It was fun to make! I made a dip for ALL my sons high school football team. When they came to our house to watch the replay of their last game and go swimming. Most would stay for dinner. I used gr. beef. 1 pkg taco seasoning Velvetta cheese rotelle tomatoes and a large can of retried beans. In a slow cooker with tortilla chips. This is so fun and adorable! I’m not into football either but I do love the food. 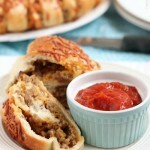 This would be such a hit at any game day party! You are so creative! This is such a fun idea! Oh it was Rhodes recipe, I just re-created it, but it was a lot of fun to do! Thanks anyway Jessica!